If you were old enough to know what was up in 1996, you probably remember a little group of ladies known as the Magnificent Seven. The U.S. Olympic women's gymnastics team captured the hearts and minds of pretty much everyone with a pulse during the Atlanta games with their high-flying against-all-odds come-from-behind tour de force to win team gold. 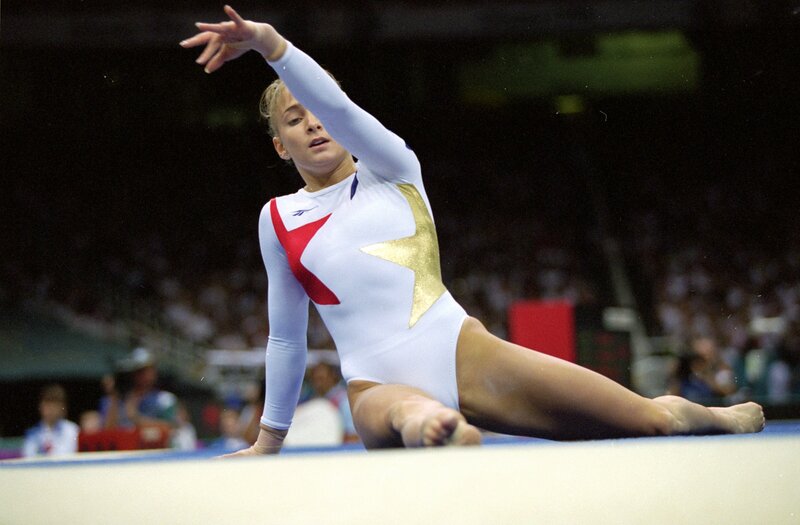 But, as gold medalist Shannon Miller tells Bustle, her favorite team moments came after the games were over. "Some of my favorite memories from all my years with the team are from touring after the  Olympics," she says. Unsurprisingly, the most special moments came after the national anthems and podiums had been put away. "We didn’t really know each other all that well at the Olympics, but on tour, we got to know each other really well," Miller says. "We toured 99 cities, and it was great to celebrate throughout the U.S. with the people that had supported us." Miller's years of effortlessly flipping and flying above a four inch-wide wooden beam seamlessly transitioned into a career as a fitness lifestyle expert and author. She is also now the proud mother of two little ones, ages 6 and 2. And, when it comes to helping her kids keep things in perspective in a world laser-focused on performance and success, Miller has a go-to strategy. "We don’t talk a lot about accomplishment," Miller says. "With my parents, their focus was on going out and doing your best, and if you fall down, you get back up. I hope that I can impart that message to my kids as well." And that's not all that Miller is up to. Miller, a brand ambassador for Hershey's, is combining two of her favorite things — "chocolate and gymnastics!" — to prove that life's little memorable moments can be just as important as the big ones. As Miller explains, pretty much everyone has chocolatey memories of childhood — and she is no exception. "For me, growing up, it was baking cookies with my mom. She also kept a bag of Hershey's Kisses in the refrigerator so she could eat two every day." If you need a reminder of Miller's still awe-inspiring gold medal performance from the Atlanta games, here it is.